Located one hour south of Brisbane, Australia’s Gold Coast is simply a must-visit. Offering 70 km of beaches, and nearby world heritage national parks, and subtropical rainforest to explore, the area is famous for its sunny and warm climate. With an annual average of 300 days of sunshine per year, it’s the perfect setting to enjoy some time outside! Here’s everything you should get up to when you’re down under on the Gold Coast. Australia’s Gold Coast is a surfer’s paradise, with consistent year-round surf at all of their 35 patrolled beaches. Popular surfing spots include Burleigh, Currumbin, Kirra, and Snapper Rocks — all known for their phenomenal point breaks. 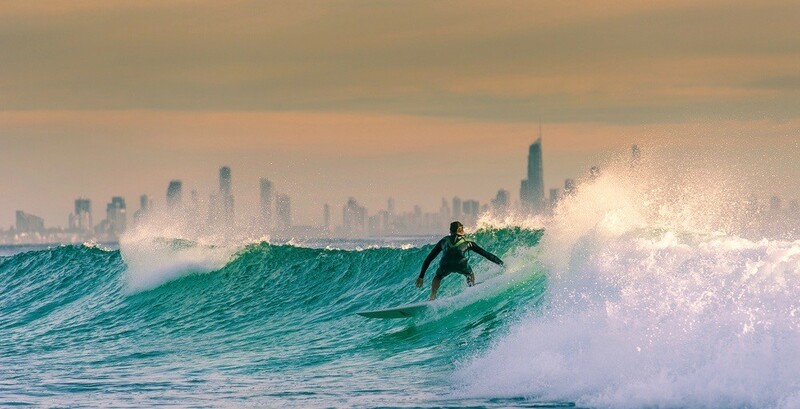 While visiting the Gold Coast, you can learn to surf at several locations with Go Ride A Wave, or you can even learn first-hand from ex-World Champion Cheyne Horan at School of Surf! While the Gold Coast beaches look beautiful any time of day, they look even more spectacular at sunset and sunrise. To best capture the famous beaches for your Instagram feed, head to one at sunset with a picnic dinner. Capture the sky as it turns brilliant shades of red and gold over the crashing surf. Springbrook National Park is a UNESCO World Heritage site in the Gondwana Rainforests of Australia. Only a short drive from the city you can go for a hike at Springbrook National Park where you can take in local wildlife and breathtaking waterfalls. Don’t miss the Natural Bridge Waterfall and Purling Brook Falls. Visit the Springbrook National Park at night, and see Australia’s largest population of glow worms within Natural Bridge Waterfall. As the sun sets, the cave is illuminated with the tiny worms that make the cave look like it’s filled with starlight. Right next to Burleigh Beach in Burleigh Head National Park, which has a not-to-be-missed lookout point, there are several hiking trails to pick from. The 1.7 km Rainforest Trail is the most popular of the bunch, offering a beautiful, lush bushes on one side with an ocean view to match on the other. At the top of the hill, you’ll find Tumgun Lookout where you can enjoy panoramic views of the coast. Make sure to keep an eye out for humpback whales in the spring and winter! Currumbin Wildlife Sanctuary is a heritage-listed zoological garden where you’ll find 270,000 square metres of rainforest and have the chance to encounter Australian wildlife. Within the sanctuary you can walk through open animal enclosures and get up close to some of the animals, and even feed kangaroos and lorikeets! After getting to know the local wildlife, you can take to the trees and challenge yourself to the adrenaline rush of the TreeTops Challenge High Ropes Course, where you will get a birds-eye-view of the rainforest. For more information about Australia or to plan your next trip to the Gold Coast visit Australia.com. Disclaimer: Travel, accommodation, and meals were provided by Tourism Australia. All views and opinions are those of the author.